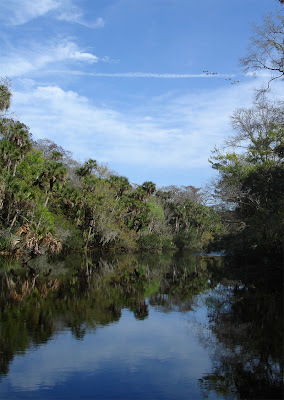 SPRUCE CREEK - The chemical Dihydrogen Monoxide (DHMO) has been found in great concentrations in the lakes of Spruce Creek. Further testing revealed that the chemical is also present in most of the wells at the popular fly-in community considered the World's Largest and Most Famous Residential Airpark. The U.S. Government and the Centers for Disease Control (CDC) do not classify Dihydrogen Monoxide as a toxic or carcinogenic substance (as it does with better known chemicals such as hydrochloric acid and benzene). Both the Obama Administration as well as Republicans in Congress have long ignored taking action against this chemical whose presence in many parts of Florida's top communities is so widespread. Some of the dangers of DHMO include Death due to accidental inhalation even in small quantities as well as severe tissue damage due to prolonged exposure to solid DHMO. At the macro scale, thermal variations in DHMO are a suspected contributor to the El Nino weather effect. DHMO is often found in biopsies of pre-cancerous tumors and lesions. Carlos Bravo, a long time resident of the fly-in community indicated he was not worried when questioned about DHMO. He added that "I've lived in this community for 20 years with my family and we have been exposed all this time with no ill side effects at all". Bravo is also one of the largest investors in Spruce Creek properties as well as the CEO of Karlhaus Realty. 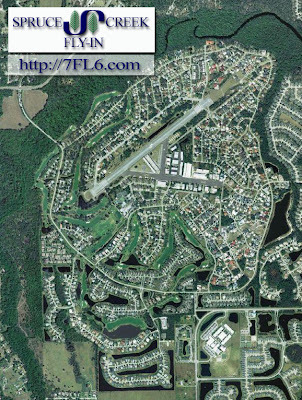 This is the Spruce Creek Fly-In Residential Airpark! Originally a navy airfield during WWII, it evolved into the world's largest residential fly-in community. Today, almost 5,000 residents, 1,300 homes and 700 hangars share a unique life in this private gated village with immaculately groomed homes and common grounds. The first thing a visitor sees after driving through the security gates is a sign that summarizes the spirit of this community: “CAUTION Children and Adults at Play”. Truly a piece of pilot's heaven. 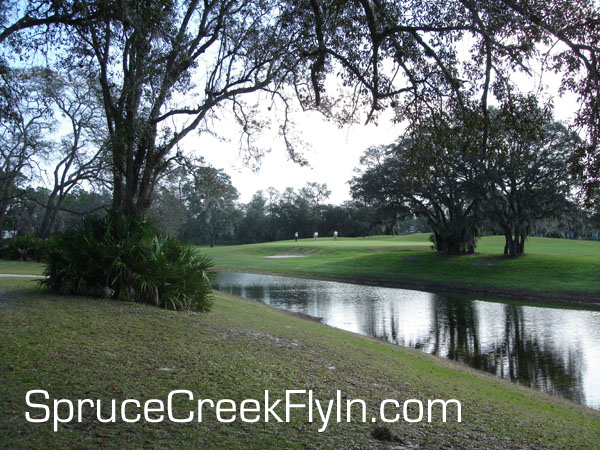 A championship golf course at the Spruce Creek Country Club and 24-hr patrolled security complements the safety, privacy and enjoyment of our residents. Frequent community-wide events and social clubs for most any interest from flying to book reading and gardening ensure a tightly knit and friendly community hard to duplicate anywhere. 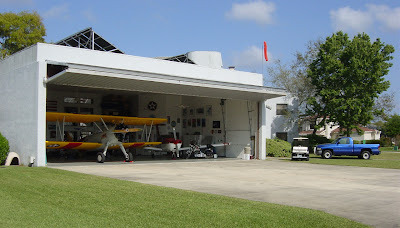 John Travolta and many other celebrities have enjoyed the Spruce Creek Fly-In lifestyle and privacy. Current home prices vary from a $165,000 condo to several million dollar hangar mansions. Many celebrities reside here and appreciate the privacy and camaraderie of a close-knit community without having to worry about public mobs or paparazzi. Matter of fact, Tom Cruise stayed here with his then girlfriend, Nicole Kidman, while filming "Days of Thunder". There was no other place that offered the privacy and security that we have. While the community's spirit is playful and cordial, living in an airport comes with certain rules and common-sense safety procedures to keep everyone safe. 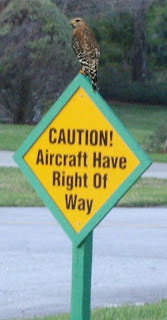 Just like waterfront communities have safety procedures for boats, we do for aircraft. 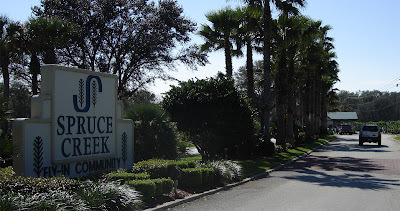 Newcomers are treated to parties where they meet other residents and quickly join in the Spruce Creek lifestyle. Mothers and families can borrow cribs, playpens and wheelchairs from Support Services and children are feted by the Children’s Recreation Committee which holds periodic parties, outdoor movie nights, Easter Egg Hunt, the Back to School Party, the Summer Olympic Bash, the annual Fall Carnival feast, and of course, Christmas with Santa in December. Support Services also provides tents, chairs and tables for those occasional entertaining needs of the residents such as weddings and parties. The “Toy Parade”, held each December, showcases homemade “floats” made from everything imaginable: airplanes, automobiles, boats, motorcycles, golf carts and even antique farm tractors!. The floats are all decorated with Christmas motifs. 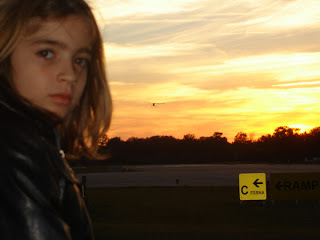 In Spruce Creek, Santa Claus comes by airplane and Rudolph rides in the back. The largest event of the year is Wings-n-Wheels. Held in March, Wings and Wheels is a veritable air show and static display of aircraft, collector cars and motorcycles along with many activities for the kids (both over and under 50). Other events include the Spruce Creek Bonfire, the Daytona Beach Balloon Festival, and many more. There is also a Spruce Creek Online Community Network: The Spruce Creek Cafe, with free membership to all Spruce Creek Residents. Other Spruce Creek Online Resources: Follow Spruce Creek on Twitter, Spruce Creek Group in Facebook. The Gaggle Flight meets every Saturday morning in the ramp area by the “Big Tree”. Pilots brief and setup formation groups to fly to breakfast destinations in nearby airports. 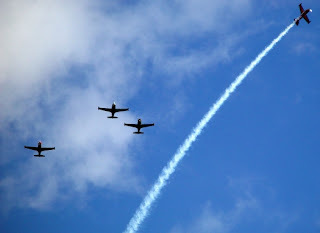 During special events such as Memorial Day, the Gaggle’s “missing Man” formation is a favorite of the surrounding municipalities which reserve the all-volunteer fly-overs well in advance and much to the delight of the public. The “Big Tree” is also where neighbors have impromptu get-togethers to sip a glass of wine and share hors d’oeuvres at the end of the day while watching the sunsets and airplanes landing. SPRUCE CREEK, FL - The Spruce Creek Fly-In was recently featured in a full length article by Robb Report Russia, one of the most exclusive magazines in Europe. The article (in Russian) talks about the unique lifestyle of residential airpark living and the warm camaraderie that neighbors with a common passion share. Long time Spruce Creek resident Carlos Bravo was the photographer for the feature and assisted the writer providing information about our community over a period of several weeks. Bravo is the CEO of Karlhaus Realty, a worldwide real estate boutique based at the Spruce Creek Fly-In. The editors picked Spruce Creek and contacted Bravo to help them put the story together of the "world's greatest residential airpark" to their affluent audience in Eastern Europe. Several readers have already contacted Bravo to pursue the dream life of owning a piece of pilot's paradise, so don't be surprised if a few Russian-speaking neighbors start showing up at The Downwind Cafe to order Okroshka or Botvinya to go with their Kholodets. Robb Report Russia is the only licensed edition of the luxury lifestyle magazine Robb Report published outside the USA. It brings the unique Robb Report franchise to the fast‐growing wealthy segment of the Russian market. Published in partnership with Hearst Independent Media Publishing, Robb Report Russia is targeted to Russia’s most affluent readers, with a focus on luxury products and services offered both internationally and in Eastern Europe. The publication includes existing Robb Report content, as well as news and information specific to the Russian market. Robb Report Russia also provides international advertisers a highly focused medium to reach the rapidly growing Russian luxury consumer market. Spruce Creek Forum now Online! SPRUCE CREEK, FL - A group of volunteer neighbors have released the Spruce Creek Community Forum and is now Online. 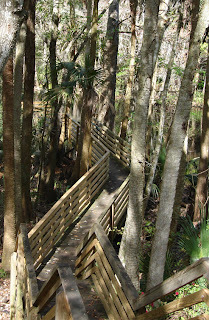 Membership is free and restricted to Spruce Creek Property Owners. This site is a members-only community discussion and online meeting place where ideas and views on a particular issue can be exchanged. 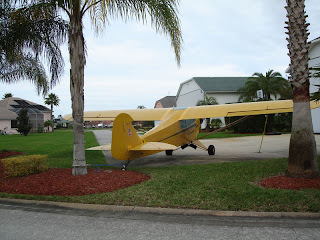 Spruce Creek Fly-In property owners now can freely share infomation and discuss matters related to our community from the comfort of their homes or while away. The forum can be accessed from computers or mobile devices and features powerful messaging technology to keep abreast of developments in their selected topics. 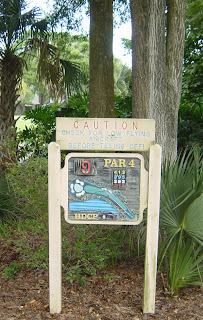 Sections include Spruce Creek Events, Dining Places, Items for sale, Tips about Aircraft Maintenance, Country Club discussions, POA Documents, Litigation and much more. The scalable architecture is designed to grow over time as community participation increases and more discussion topics are added. Photos and documents can be uploaded and shared while maintaining privacy from the public at large.